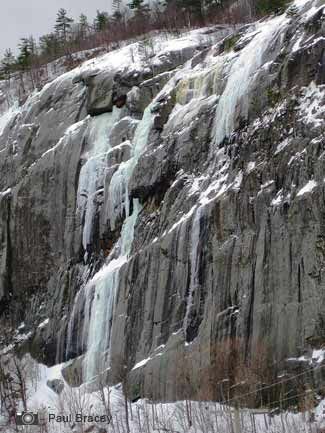 The Adirondacks offer a tremendous amount of ice climbing for all ability levels. They are located about 5 hours north of New York City and can offer day trips to remote back-country adventures from lower-angles flows of ice, to overhanging walls, to multi-pitch cascading waterfalls. We offer professional instruction and guided ice climbing daily from November through March. Chapel Pond Area - located on RT 73, just before Keene Valley, it includes a vast amount of ice: Chapel Pond Slabs, Crystal Ice Tower, Chouinard's Gully, Power Play Wall, Chapel Pond Canyon, Roaring Brook Falls, and many others. Route 9N & Eastern areas - located on County RT 9 between Keene and Elizabethtown and east, it includes Lock Ness, Knob Lock Mountain (Jaws, Unexpected Pleasures, Baksheesh, etc), Poke-O-Moonshine (Positive Thinking, Waterfall, Discord, etc. ), Lake Champlain, and more. Lake Placid areas - located on RT 73 between Keene and Lake Placid, the area contains a vast amount of ice including: Pitchoff Quarry, Pitchoff Right & Left, the Sisters, Cascade Cliff (Jaws, Cascades Ice Dance, etc), Pitchoff North Face (Central Pillar, Arm & Hammer, Tendonitis, Screw & Climaxe, etc. ), Wilmington Notch (Chillar Pillar, Multiplication Gully, etc. ), and many, many more. 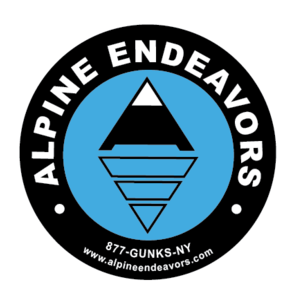 High Peaks - backcountry, alpine-style routes consisting of long approaches and descents and involved climbing. Areas such as; Wallface, Avalanche Pass, Mount Marcy, Gothics, Pharaoh Mountain (southern region) and others.